Rob Daley, our Executive Chef, is in charge of the recruitment and the selection process of our chefs for our chalets and villas. It is also his responsibility to ensure outstanding menus and staff training, so that our guests experience delicious food and fabulous service throughout their vacation with us. How long have you been with Scott Dunn? I have been with Scott Dunn for nearly 7 years now and have had the pleasure of cooking in some of the best chalets and villas in France, Austria, Switzerland, Spain & Portugal. What is your cooking background? I trained and worked for a number of years in Leeds before I traveled to Australia. I worked at Quay (one of the world’s best restaurants), which bizarrely is where I got the idea to work in a winter resort and therefore for Scott Dunn. What is your day-to-day job? I work closely alongside our Guest Services Manager, Stuart Bathgate, to train and develop the Scott Dunn chefs. As a chef, the only menu I set as “standard” is the breakfast menu; all the others are the villa or chalet chef’s own. I am lucky enough to be resort-based and travel between all our resorts regularly. My day-to-day job is monitoring the menus, quality of the food served on each guest’s vacation and shadowing chefs through their daily routine. Where have you cooked for Scott Dunn? Nearly every property – I never know where I am going to be each day, let alone each week! I am planning to get a ‘full house’ this winter by cooking in every chalet at least once! Which is your favorite summer resort / villa and why? What ingredients are you most happy using? Local and seasonal produce, during the summer months these are most abundant! Combined with super fresh fish and you are onto a winner. Our local fruit and vegetable shop C’an Fusteret in Pollenca always has a plentiful supply of different, exciting produce, far removed from the bland, easy to transport, homogenous supermarket produce. I am always on the lookout for the biggest tomato I can buy – the current record holder weighed in at 1385 grams! What is your favorite style of cooking? More and more, I have moved away from fine dining – honest ingredients cooked well and served in a ‘Tapas’ style is my favorite way to eat. I don’t subscribe to any predefined ideas of what tapas are either. The chefs are always happy to tailor the food to a guest’s preference away from the formulaic chalet set menu our competitors use. Have you got any summer bbq tips? The only way to barbeque is over very, very hot charcoal – avoid gas barbeque. What dish / meal has most impressed you this summer? Eating Portuguese razor clams, whilst overlooking the surf in Arrifana in the Algarve. What dish / meal have guests most raved about (that you know of)? Alex Edgecombe’s French heritage always make the Savoie-themed evening a hit! Which canapé has been the most popular? When I cook in St. Anton am Arlberg in Austria, the canapés I prepare the most is local speck with a yellow carrot, kohlrabi & sweet mustard remoulade. Where would you choose to eat locally on your day off? Usually the cheapest, least friendly restaurant! Occasionally I will treat myself – 1789’s cote de boeuf in Val d’Isere, the Rodelalm’s schweihaxe in St. Anton am Arlberg, Zum See’s calves liver in Zermatt. I recently visited Jardin in Alcudia and enjoyed a showcase of contemporary Mallorcan cuisine. 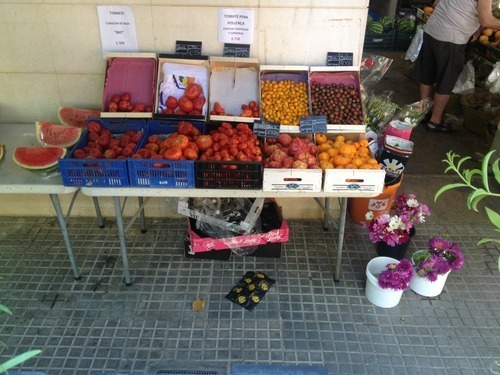 Do you have any favorite food markets in the Med? Aljezur, just north of Lagos and just within reach of villa Casa Corsino! A Dutch lady sells her own organic fruits & vegetables. The fish is of Japanese quality you could almost be in Tsukiji! Which spice or herb could you couldn’t live without? 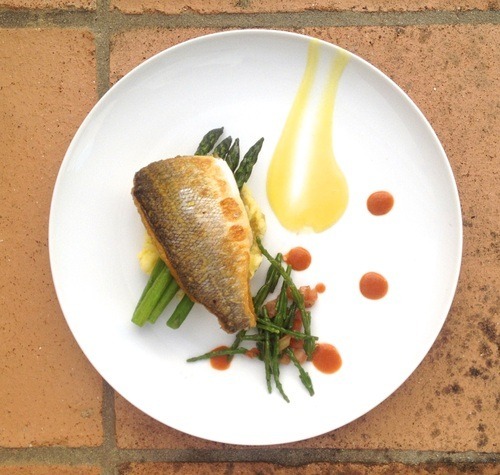 Our Spanish chef Sergio Cano Gil couldn’t live without paprika, no really! But for me it would have to be fresh coriander. It is so versatile – use the leaves, stems and roots in different ways to lift nearly any dish. The only real things I couldn’t live without are French croissants and proper coffee, just like we serve in our Flagship chalets in the winter – there’s nothing like it!